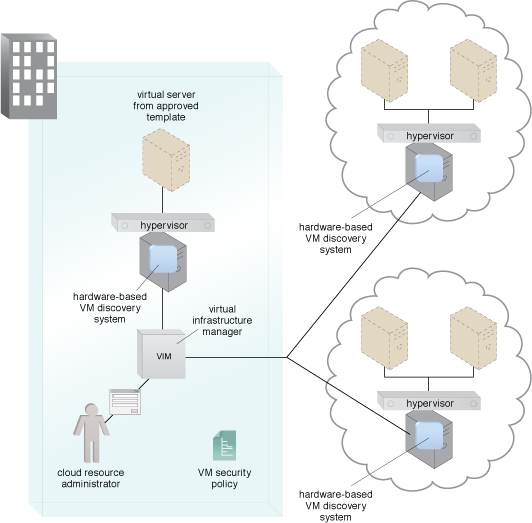 The hardware-based VM discovery system operates in the physical hardware and provides the capability to locate hypervisors in memory and analyze nested virtualization setups showing the relationships among machines. It provides a transparent mechanism to recognize and support the address space of the virtual machines. In Figure 1, a master VM discovery system monitor communicates with each host’s hardware VM discovery system. It monitors the number and security state of each VM, referring to security policy and responding if a rogue VM is discovered. VM discovery normally requires access to the physical memory of a machine to perform OS and memory mapping and automatic detection. Figure 1 – An example of a VM discovery architecture.